Delicate pink flowers with upswept petals appear in winter or early spring above rounded, silvery-green leaves. 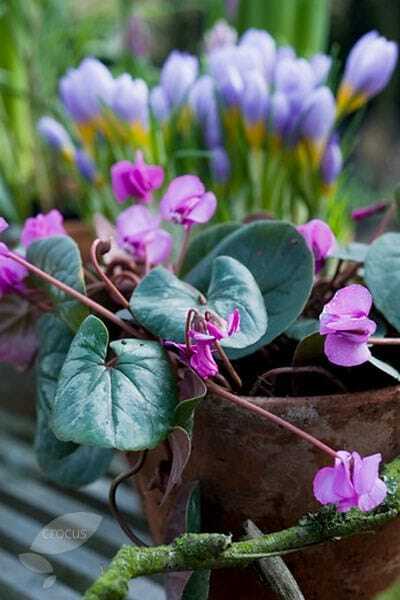 These diminutive cyclamen are perfect for naturalising around the base of deciduous trees and shrubs. Best in humus-rich, well-drained soil in partial shade, they make excellent companions for ferns and other shade-loving plants. Garden care: Plant tubers with the rounded (usually smooth) side down, shallowly in humus-rich, fertile soil. Apply a generous 5-7cm (2-3in) mulch of well- rotted leaf mould around the crown of the plants in spring as the foliage starts to die back. I can think of nothing negative to say about this lovely delicate little plant. Hi there, am I too late to plant these now (this coming week, 6th Nov)? Am in London so not so cold. And will they flower this winter-spring or would it not be until next year? thanks so much in advance. Hello, No, it is getting late in the season, but it's definitely not too late to plant these corms. When do you plant these bulbs?